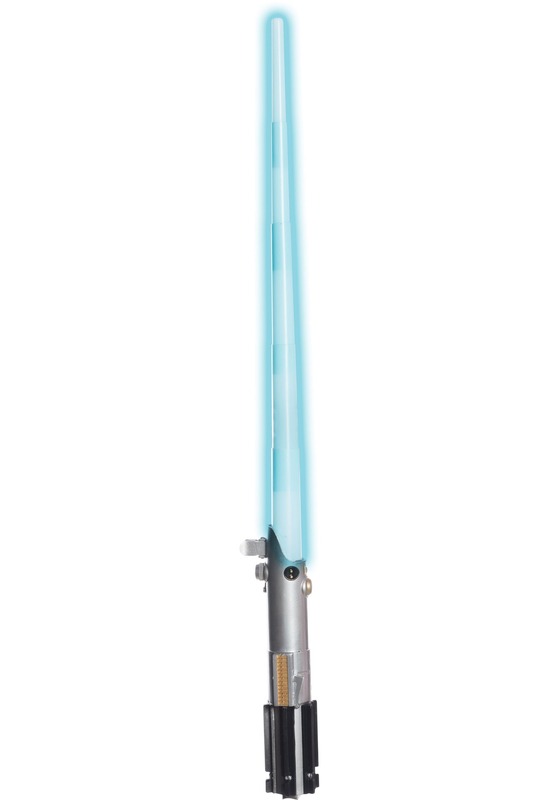 Ahh, the Skywalker lightsaber. It's had quite the journey, hasn't it? Anakin Skywalker had to make that lightsaber after he lost his first one on Geonosis (not sure why Anakin kept losing his lightsabers, but that wasn't the first). Of course, that lightsaber was later passed on to Luke when he was old enough. He immediately pointed the elegant weapon at his face, showing that maybe Luke wasn't quite ready to be a Jedi. Later, Luke lost that same lightsaber on Bespin after his legendary fight with Darth Vader. Now, that's where all of us fans thought it remained, but apparently, Maz Kanata got ahold of it and was able to give it to Rey! So, that's how this particular saber of long and interesting history has become known as Rey's lightsaber. This particular toy is modeled after her saber as seen in The Force Awakens and the Last Jedi. Wield it, and become a true Jedi. After all, you're part of its history now, too.